Pen-Touch LCD Graphing Calculator with large high-contrast display, a unique multi-line Equation Editor, simplified operation keys, and touch-screen editing. allows you to enter, store, and edit up to ten graphs! The EZ key makes Rapid zoom, Rapid graph, and Rapid window easy. 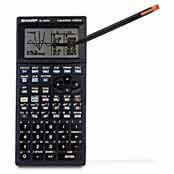 enables you to navigate easily by touching the durable screen with your finger, pencil eraser, or stylus that is stored conveniently inside the calculator. solves second and third degree polynomial equations. shows equations exactly as they appear. allows you to solve equations both numerically and graphically. includes 32KB RAM, financial functions, split screen option, built-in and self-made slide shows, communications port, and protective hard cover. Determinant, Transpose, Inverse, Elementary Row Operations, Augment, and Reduced Row Echelon Form STO and all scientific calculator functions Row Swap, Row_plus, Row_mult, Row_m.p. (w x h x d): 3.4" x 7.2" x 0.8"
This page is part of GeneralManual.Com Network SHARP EL-9600C Graphing Calculator User Manual.